Ya what? That’s what I said! This months Daring Bakers’ challenge is hosted by Manal Obieda, known as Manal’s Bites. Manal explained that Yafawi Sfeeha is a great authentic dish from Jaffa in Palestine. Manal also stated that it is served as a main meal along with a bowl of soup or a salad. 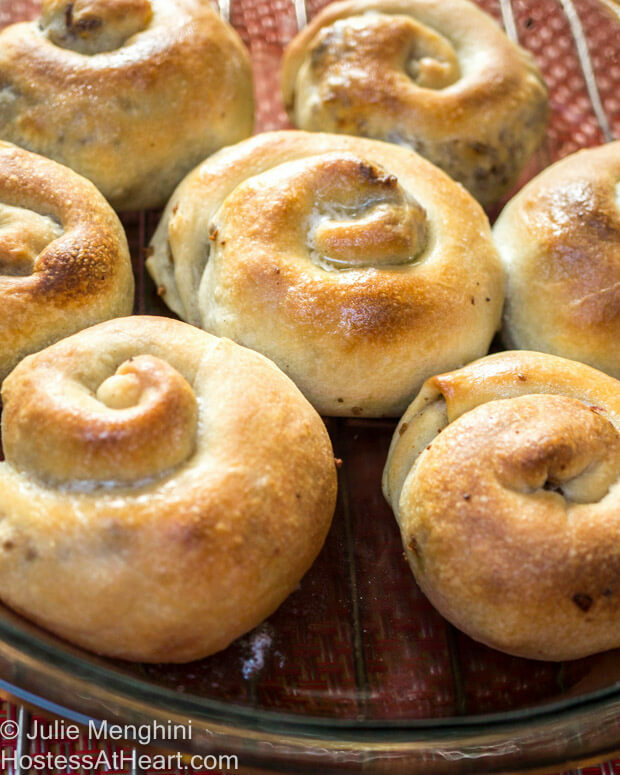 The “Yafawi Sfeeha”(meat pies) or also known as “Milwayeh” which means twisted, is crispy yet tender and full of flavor. The great thing about this recipe is that it is so versatile. I used an easy beef filling, but you could easily do a cheese or vegetarian filling, or a walnut filling for a sweet version. I also loved the fact that it is baked, so makes it a health conscious choice too unless you use a pound of ghee. Go for it, I don’t judge! The dough is very easy to make. It is best to let it sit for a couple of hours, but you can do it earlier in the day or a day in advance. A quick and easy roll that can be made with meat, cheese or vegetable filling. Perfect as a main meal or striking finger food appetizers. Mix flour, salt, sugar, powdered milk and vegetable oil. Start adding the warm water until you get a tender, slightly sticky dough. Kneading will take about 8 minutes with an electric stand mixer using a dough hook, or 12 minutes by hand. Use additional flour if needed. Form the dough into small golf-ball-sized rolls. Place on a baking sheet that is very well greased with ghee or olive oil and pour some more (oil or ghee) over dough. Cover and let rest at room temperature for a least 2 hours or over night. Brown Beef and diced onion. Salt and pepper to taste. Allow to cool slightly. Stretch each ball of dough into a very thin circle (I did this on a pizza pan). Fold the left and right sides to the middle until they meet in the center and form a rectangle. Spread a small amount of filling along the seam. Roll the dough tightly over the meat filling, forming a rope. Turn the rope into a swirl and put on a well greased (ghee or olive oil) baking sheet or pie pan. Continue making the rest of your Sfeeha using ghee to keep it nice and moist. I served our Sheefa with a salad, and we really enjoyed this recipe. John finished them off over the next couple of days as his lunch with a side of fruit. Thank you Manal for this unique dish and for your wonderful step-by-step instructions. Please check out Manal’s blog for this wonderful recipe and many others. There’s so many posts to catch up on since I’ve been gone for the summer but this one really stands out! It looks so good! Thank you! I hope you had a wonderful summer! Thank you! I had never heard of them either and that’s what I love about those challenges. I am very honored to be featured on Fiesta Friday! It is such a talented crowd so to even be considered amazing. 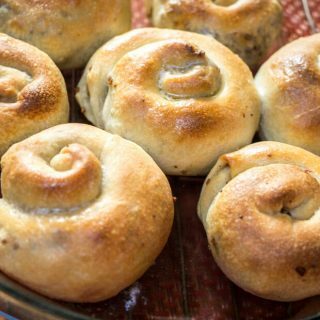 Hey Julie, I just came upon this recipe, I love meat buns and I like how simple the dough recipe is. Pinned for later! These look like the perfect thing to go with a salad. And I love the idea of making them smaller for appetizers. Thanks for adding your deliciousness to #SaucySaturdays. Thank you Christine! They would be a perfect side to a great salad. These look so fabulous and difficult to make but your directions are great! These might have to make an appearance at my next party! Thanks for sharing at #SaucySaturdays! Thank you! They are VERY easy to make, and could be made smaller with any filling you like for an appetizer! I never had either. This bread was different for me but we enjoyed them. It’s interesting that we stuff our bread in about every culture and call it something different. These look yummy, Julie! It’s nice you can put different types of filling in them, too. You are my hero for trying all of these amazing recipes from all over the world. You make it sound like it is no big deal, but somehow I think mine wouldn’t turn out quite as well as yours. Great job! Thank you Shari! I had to laugh at your comment. Sunday I burned a simple brisket and yesterday I made some bread that morphed into a creature from another planet. I should take pictures and keep for a not so successful folder. I think you make everything look so easy and delicious! I guess if we didn’t, we would be called Pinterest? These sound really delicious and I love the fact you can eat them up over a few days and put them in a picnic for lunches out. Thank you Corina! My husband finished them all off by himself and he really enjoyed them. I liked how versatile they were. Thank you for stopping! Just wanted to officially welcome you to Fiesta Friday Julie, and thanks for your contributions, both of which will be very well received by the crowds. Enjoy your weekend, stay hydrated. Thank you for cohosting Loretta! We couldn’t be taken care of any better. You’ve been so busy, but you are such a sweetie to take this on too! Thanks Julie, you’re sweet. Just wanted to help Angie out. Summer is especially busy for everyone, and we’re off again next week to Toronto, but was happy to have squeezed in another co-hosting :). Keep on blogging friend! Wow! These look so amazing! I’m always afraid to try something like this, but you made look so simple! I can’t wait to try this; I am always looking for another recipe to spice things up a bit. It really is so easy, and my husband liked that he could just heat them in the microwave, grab one and eat it for lunch. You could fill them with about anything, and they are very easy to put together. You are so sweet Lina! Thank you and enjoy your day! Thank you! They were so easy to eat and we really enjoyed them. I could eat 2 as a meal but my hubby went for 1 or 2 more. Well looky-loo here Julie, you continue to amaze me with your challenges. These (I won’t even begin to pronounce them) look just delicious. I love how you are broadening your culinary vocabulary (I wouldn’t think a gal from Omaha knew what ghee was). Seriously, I once posted something about “ghee” and I had a barrage of curious folks wanting to know what it was. So very proud of how you take these different challenges and go for it. I truly would love to challenge myself too, especially with the bakers challenge, but alas, I’m desperately trying to stay away from carbs, even though my husband just loves bread. I’ve made a couple of yours in the past, the english muffin loaf that he really enjoyed and also one that you posted recently – oatmeal/applesauce. I ended up trying a slice of the latter and then wrapped it up for one of my daughters in NYC this past weekend. The other daughter asked for banana/choc chip. So they were both happy with their care packages :). Seriously, you are learning a lot of tips and tricks with the bakers challenge, but you are also finding out about other cuisines – from Palestine eh? YOU GO GIRL!!! Bravo! So proud of you! Thank you Loretta! I really enjoyed this challenge because it was new to me. That’s one of the things about loving. I would never have even known what ghee was without my blogging buddies. My neighbors asked what it was when they saw my post, and I felt so worldly. 🙂 Some of the things I bake go right to my neighbors or John’s parents because they are dangerous. These little meat pies made a perfect lunch for my husband. I think it’s wonderful that you take “care packages” to your daughters. I just loved seeing the pictures of you with them on Facebook. What a beautiful family you make! Enjoy your day Loretta, and I always love hearing from you! Thank you so much Jess! They were so easy to make and you know I love working with dough. Thank you Freda! I appreciate you stopping by! Thank you Lili! The did come out well. I enjoyed this challenge. I’m there with you Ana! I’ll make another batch and meet you on the patio. Thank you! You aren’t a kidding! I am not proficient in these names either, but I am all there to eat a few.